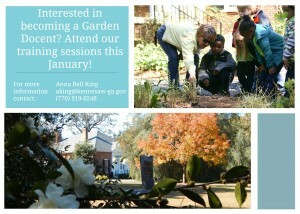 Do you like being outdoors and sharing information with eager learners? Join our volunteer docents (guides) at Smith-Gilbert Gardens and get ready to conduct tours in Spring 2017! ‘That Lambs Ear is like a blanket, so soft’ or ‘wow, these pitcher plants are cool, I cannot believe how many insects it has trapped’; these are a few of the wonderful reactions children share with you during a guided tour of the garden. Smith-Gilbert Gardens, a 16 acre botanical garden with more than 3000 species of plants, about 30 outdoors sculptures and a historic home on site, is seeking volunteers to help lead tours of interested visitors, both children and adults. All who are interested should contact us at info@smithgilbertgardens.com and sign up for the free docent course starting January 23, 2017. 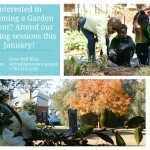 During 5 consecutive Mondays (1/23, 1/30, 2/6, 2/13, 2/20) from 9:30am-Noon you will receive training providing you with the necessary info in horticulture, history of the property, info about the sculpture and how to tour children through the gardens to confidently lead a tour around the gardens.